Share with others how the film or dragon boating have helped you or your family. In 2012 I was rearended by a drunk driver and suffered a Mild Traumatic Brain Injury. This has caused me to have stress related seizures, inner ear damage, and balance issues. In May of 2014 I was just starting to recover somewhat from this accident and was just starting to get my life together when I went in for my mamogram and found out that they had found a suspicous mass on my left breast. I had an ultrasound right away which verified their suspicion and then later that week came back for a biopsy. I got a phone call the next week from my physician telling me that I had grade 2 Invasive Ductal Carcinoma in my left breast and I needed to see a surgeon ASAP. I thought, what this isnt supposed to happen. I am a Respiratory Therapist, I take care of people who have Cancer. I dont have Cancer, are you kidding me? I swear I heard nothing else he told me. I just was recovering from a head injury what the hell do you mean I have Cancer. My grandmother had Breast Cancer x3 and had to have a mastectomy she passed away from Ovarian Cancer in 2007. I lost my Aunt 3 years ago to a strange vaginal cancer, my uncle to lung cancer 5 years ago and my father 2 years ago to colon cancer. I had my lumpectomy July 30, 2014 and had a couple of lymph nodes removed. My diagnosis was Stage 1b IDC grade 2 ER/PR+ no lymph involvement, HER2-. My treatment was 28 rounds of Radiation with 8 boost treatments and Tamoxifen. I burned very very badly with my Radiation. So bad that I had skin hanging from under my breast. I had a chest CT recently due to SOB and it showed that my left upper lobe of my lung is mildly scared due to radiation and I now have a nodule in my left middle lobe of my lung. I will have another CT scan in November to see if the nodule has changed to see if we need to biopsy it. 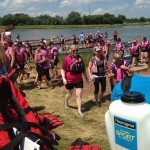 I joined the Indy SurviveOars Dragon Boat Team in Oct of 2014. It was at the end of thier season so I didnt get to paddle with them yet, but from the very first time I met them they were very warm and very welcoming. I just felt at home. This is my first year racing with the Indy SurviveOars and it has been an awesome experience! They are an awesome group of ladies who have given me the strength and courage to go on. The encourage me and motivate me. Our coach and assitant coach are the best. They really do a great job of not only motivating but encouraging you to not give up and to do your best not just for the team but for you individually. To become a better person both mentally, physically and personally. This team has been the best thing for me. It has helped me to get my life back. I have made some great friends. I hope for life. I hope they feel the same. This documentary changes lives and will surely awaken the dragon within your community as it did in ours. 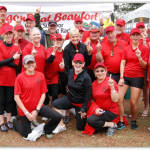 Since our community screening of Awaken the Dragon, DragonBoat Beaufort has raised enough funding to buy our own boat, conscripted over 70 paddlers, entered nearby festivals and spread our mixed cancer survivor mission. Thank you from our waterlogged and scaly hearts! Paddles up to you! Heading A headline for your story. Awaken the Dragon. All Rights Reserved. Designed by Charleston PR & Design, LLC.